Take your service skills to the next level with the Bistro Pro from CrocsÂ. The ultimate footwear designed specifically with the culinary lover and food service industry in mind. Made of patented Crosliteâ" material that softens with body heat, allowing shoe to mold to the foot for a customized fit. Hook-and-loop closures on the back strap allow a secure and adjustable fit. Dense vamp area helps protect the top of the foot from scratches and scrapes. Roomy fit allows your feet to expand and bend naturally to reduce fatigue. Ultra-cushy and extra soft footbed includes circulation nubs to help increase blood circulation. 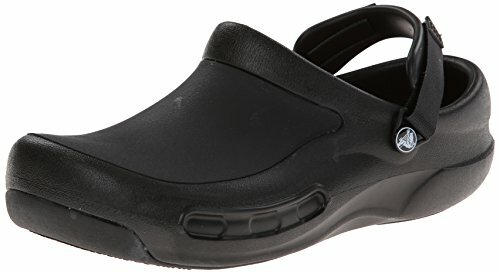 Crocs lockâ" tread meets industry non-skid and slip resistant standards for increased traction. Can be sterilized and cleaned with soap and water solution.